There was a great piece on NPR on Monday morning about how two industries who love books – publishers and libraries – are having a tough time agreeing on how library patrons should check out e-books. 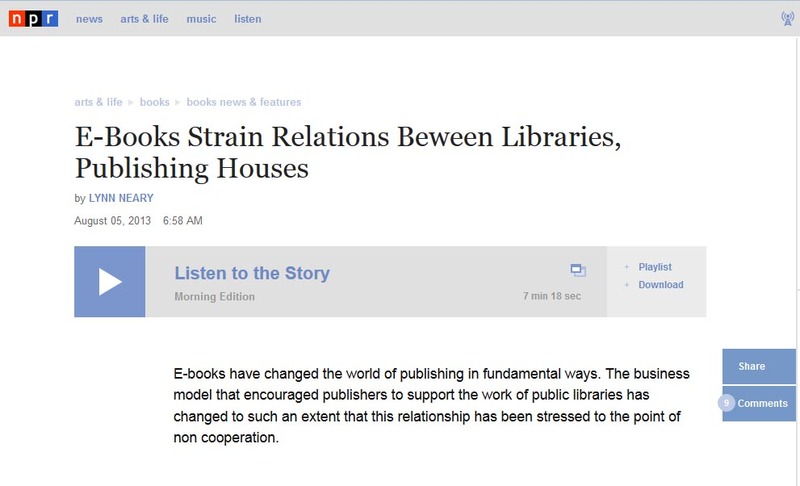 E-Books Strain Relations Between Libraries, Publishing Houses. Publishing Houses are businesses. If they don’t make a profit selling their product – books – they will not be selling books for very long (as Nightshade Books learned the hard way). Publishers love libraries, and publishers have always sold lots and lots of books to libraries, often at discounted prices. A patron gets the book, loves the book, buys the book, maybe buys a copy for a friend. Or a patron gets on the waiting list for a book, doesn’t want to wait 8 weeks to read the latest bestseller, so they go out and buy the book. Even if every patron isn’t purchasing the book, it’s still a win-win for everyone. Enter e-books, and the win-win becomes not so much. Publishers are rightfully concerned that if their e-book makes it to an interlibrary loan site with no restrictions, what’s to stop a state library system from purchasing one copy of the latest bestseller and lending it to thousands of people, all at the same time? What’s the answer? E-books and e-book lending is too new, so no one really knows yet. Simon and Schuster has a one year pilot project with a few public libraries in New York. The project allows an unlimited number of library patrons to check out the e-book when it’s first released, and offers patrons the opportunity to purchase the e-book through the library portal, giving the library a percentage of every sale. Simon and Schuster is running a giant library fundraiser, and selling their own digital content at the same time. Will they make a profit on this, proving that it can succeed across the country? I have no idea. Is Simon and Schuster sewing a ton of goodwill and starting a much needed conversation? YES. Over in Colorado, the Douglas County library system as found a different option that bypasses much of the troublesome DRM. They purchase what they can afford through the big publishers, but are now working with over 500 smaller and independent publishers, including Smashwords, to build their digital content library. They may not have that specific best seller title you were looking for, but they certainly have a veritable “stack” of e-books in the same genre. Might libraries be the next big thing for self published authors? if you’ve gotten e-books out of the library, what’s been your experience? If you work at a library, what’s been your experience sourcing e-books, and getting them into the virtual hands of your patrons?